The connection of the Haftorah to the Parsha: There are 3 connections between the Parasha and the Haftorah: #1) The Parasha of Behar deals with the laws of "Geula", redemption of property (land). Similarly, the Haftorah gives an account of Yirmiyahu purchasing a field. #2) at the beginning of the Parsha of Behar, it informs us of the laws of Shmitta, the commandment that one must let his fields rest for 1 year, once every seven years. The sages teach us that as because B'nai Yisrael failed to observe seventy Shmitta years (7x70= 490 years) Hashem exiled the Jews to Bavel for seventy years. The Haftorah tells us of this punishment by mentioning the Babylonian army's impending conquest of Jerusalem. #3) both the Torah and the Haftorah contain similar hints to the final redemption. The seal of Baruch ben Nuria, Jeremiah's scribe. Jeremiah’s Cistern (? ~ or at least something that looked like it), in the City of David, Jerusalem. King Tzidkiyahu imprisoned Jeremiah for his prophecy that the Judeans should surrender to Nebuchadnezzar, King of Babylon. The storyline of this week’s Haftorah: Jeremiah the "weeping prophet" has been jailed by Zedkiyahu, the (last) King of Judah, because of his prophecies that recommended that the Jews surrender to Nebuchadnezzar, King of Bavel, instead of fighting against them. Obviously, King Zedkiyahu had a different opinion. The Haftorah begins here: a divine word instructs Jeremiah to purchase ancestral land from his cousin Hanamel that he does according to the legal practice. 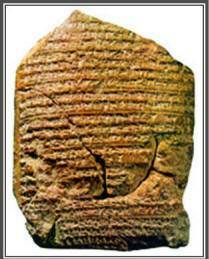 Jeremiah then instructs his scribe Baruch to preserve the documents in a Clay Jar as lasting proof. It was in the Levitical city of Anatot which was located 2 miles north of Jerusalem and was Jeremiah's home town! The palace walls of the Nebuchadnezzar king Of Babylon, who destroyed the Bait Hamikdash –King Solomon’s Holy Temple. 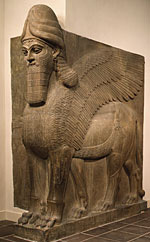 Could that be Nebuchadnezzar’s face? Jeremiah 32:14 Thus says Hashem, “Take these deeds, this sealed deed of purchase and this open deed, and put them in an earthenware jar that they may last a long time. Real estate deeds had two copies -- a sealed one and an open one. To preserve them they were usually put in earthenware, similarly to what they did with the Dead Sea Scrolls. His father, Chilkiyahu, a Kohen (who may have been the same Chilkiyahu that found the Torah Scroll Moses wrote while cleaning out the Bait Hamikdash for King Josiah) lived there with other very pious people. Jeremiah seeks to understand the symbolic meaning of the purchase. Yirmiyahu first praises Hashem with prayer, and then requests an explanation of Hashem's command.Hashem replies that due to Israel's and Judah's straying after Idolatry and turning their backs on Hashem, the Babylonians will conquer Jerusalem. (Not to worry, Hashem will return B’nai Yisrael to their fields and cities). “He installed a king of his own choosing.” (Zedekiah). A clay seal impression bearing the name of Yehuchal ben Shelemiah, a prince in the court of King Zedekiah (7th century B.C.E. 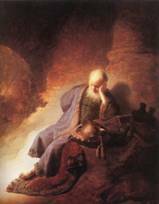 ), mentioned in the book of Jeremiah. Famous Phrases: Jeremiah 17:7, "Baruch hagever asher yivtach ba'Hashem" “Blessed is the man who trusts in Hashem and Hashem will be his helper." Recited in the Birchat Hamazon, Grace after Meals. Haftorahman's Lesson of the week: Hashem made Yirmiyahu buy a field, so that he would have the deed to the land in his hand. That way Jeremiah would know that one-day his property in Israel would be reclaimed. We too have a great deal to look forward to. Map: Jeremiah prophecies took place in Jerusalem. 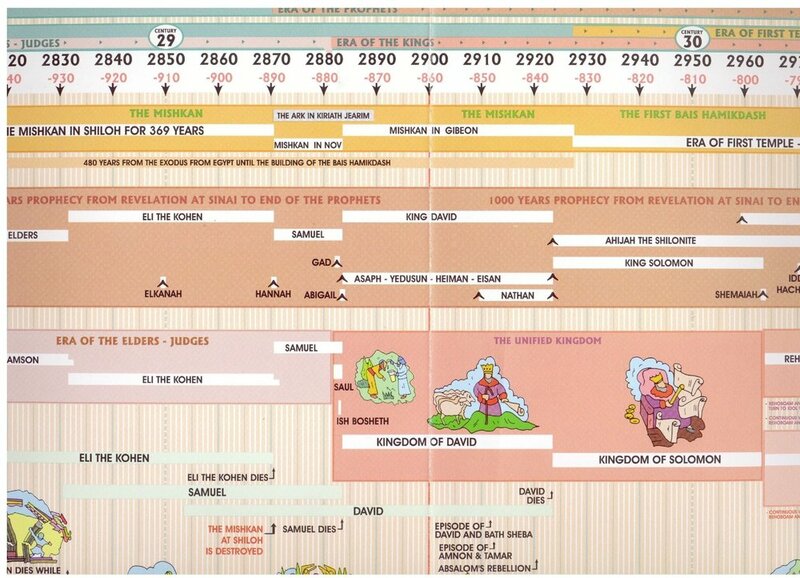 Timeline: Jeremiah prophesied just before the destruction on the 1st Bait Hamikdash~ Holy Temple.